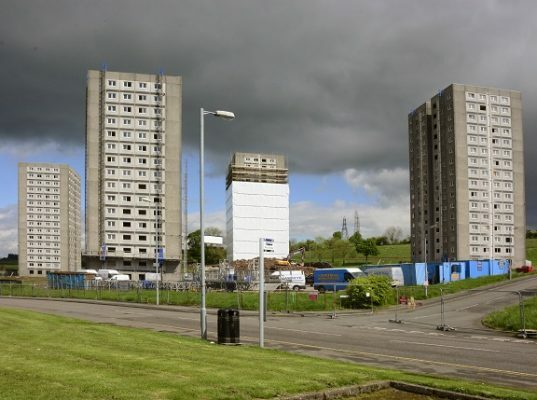 Central Demolition Limited were awarded the contract for the demolition of old housing stock at Glenapp Place and Sundrum Place in Pennyburn, Kilwinning. 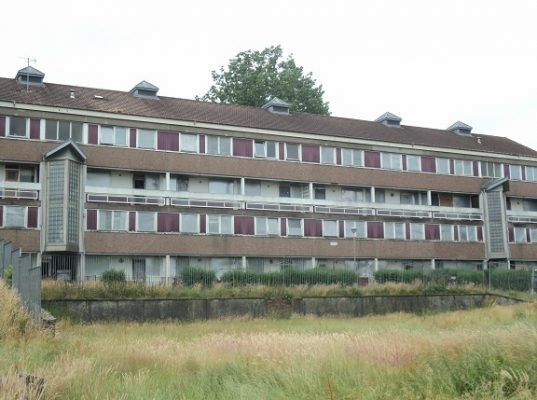 The 48 flats, spread across 3no 4 storey blocks, were being demolished to make way for the erection of 22 new homes, a mix of two-bedroom and three-bedroom houses and one bungalow, plus parking for residents. This was certainly a project where the locals were fully supportive of our work. 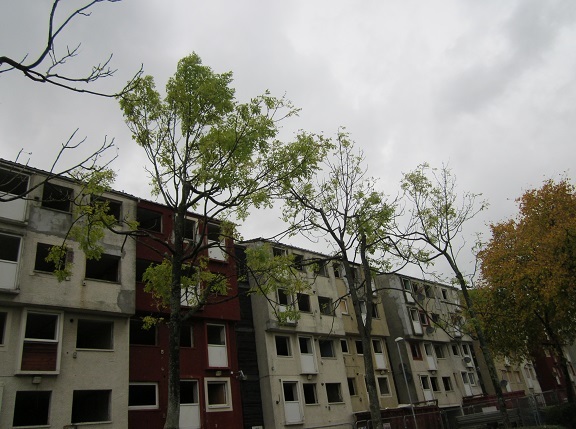 They had been calling for the old flats to be demolished and replaced for several years, and when it was announced that the properties were finally being demolished there were no complaints. Residents even partook in a street party/fun day to celebrate the decision to demolish the flats! The project had a turbulent start. Notifiable asbestos removal had been scheduled, which requires 14 day notification to the HSE. However, due to exceptionally high winds one day, two internal divisional walls had partially blown over. 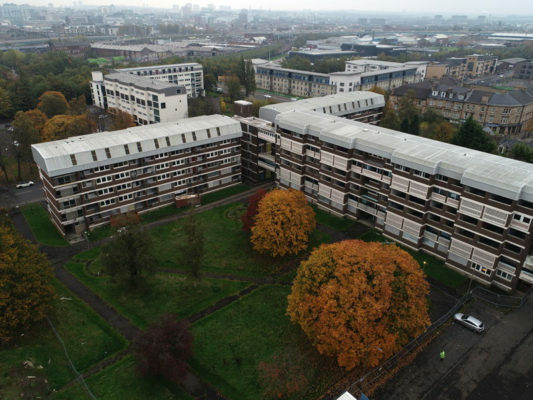 Although the debris, including AIB was contained in the upper flats, it was deemed necessary for the asbestos to be removed urgently as it represented a hazard to site operatives and to residents living within close proximity to the site. Irvine Housing Association (Lovell’s client) requested a waiver from the statutory 14 day notification period to allow making safe works to commence within a week of the incident, and this was granted by the HSE due to the extraordinary circumstances. Our asbestos team had to formulate a comprehensive plan of work as usual working procedures were not practicable in light of the conditions faced. Other activities undertaken in preparation for the demolition works included soft stripping the buildings of all non-structural fixtures, fittings etc. Due to the location of poor condition asbestos within the roof area, we undertook part of the soft stripping using tower scaffolds from the inside leaving a section of the party walls including the asbestos intact. We also removed furniture from the buildings and removed the roof. When the demolition works commenced, one of our machines began by removing the first section of the roof and carefully lowering it to the ground. After the roof trusses had been removed, our machineman folded the rear walls inwards to third floor level. The remainder of the exposed wall structure was then folded inwards to keep the debris within the building footprint. The concrete floor slab was then munched and the debris, again remaining within the building footprint, was allowed to fall down to the floor below. This process continued for each of the floors in every building until all buildings were demolished to the ground. Additional works included the demolition of a concrete retaining wall and the removal of hardstandings to the front of the building and the car park. 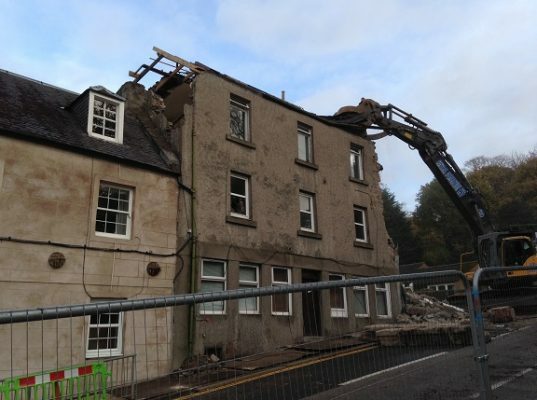 A demolition spec machine was used to remove the floor slabs and foundations. 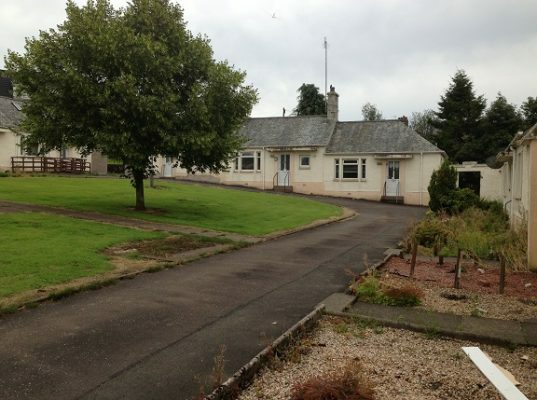 Further to all works being completed, the site was cleared and left ready for redevelopment. Throughout the works, all demolition arisings were sorted into stockpiles on site. Waste was transferred to our state of the art recycling centre in Bonnybridge for further processing and recycling. Recycled materials were then re-used and/or re-sold. There was a lot of pressure put on our team throughout the works, as time-lapse footage was being recorded for public distribution. Also, the local press covered our works, again adding that little bit of pressure. However, our men took the attention in their stride and worked safely and with precision throughout the duration of the works. This site carried no major risks, other than those inherent to demolition sites. The site was surrounded by shops and residential properties as well as a pedestrian access route to the local railway station, and therefore care had to be taken to keep the public safe at all times. Access to the pedestrian walkway was to be maintained at all times. Our team were vigilant, ensuring that no unauthorised personnel entered the site and that all debris was kept within the site boundary. Due to the close proximity of the site to a live railway line, we had to meet Network Rail’s strict requirements to ensure that we caused absolutely no disruption or damage. The local area was an urban area and very built-up, so space was at a premium on this project. Traffic movements to and from the site were carefully coordinated so as to minimise disruption caused to drivers around the site. Parking arrangements had been agreed prior to our commenced onsite to ensure that there were enough spaces available for all residents and their visitors, and this was achieved via the retention of a car park. We also had other measures in place so as to keep inconvenience to a minimum, including managing noise and actively suppressing dust generated from our works. We done a letter drop to local properties to let them know what works we would be doing and to provide contact details in case they had any queries or concerns. Despite the difficulties experienced during the works, the project was completed safely. The works ran slightly over programme, mainly due to the emergency asbestos removal works required and the additional works awarded to us by the client. Lovell were very satisfied with the standard of work demonstrated on site and we hope to work with them on future projects where opportunities arise.